Ubuntu 14.04 Update breaks grub, resulting in "error: symbol 'grub_term_highlight_color' not found"
To fix the problem I had to boot to my persisting Ubuntu installation (e.g. using Super Grub Disk) and had to reinstall grub on my boot partition: "sudo grub-install --recheck /dev/sdx"
I have a Quantal liveUSB at hand and booted from it. I ran the grub-install from it and fixed the boot. Now when I boot the grub version shows as 2.00. When I can boot to Trusty I ran grub-install again in hope of making the grub version current and I hit this error again. So it appears there's a bug in the current 2.02 beta version. It also happened to me, right now. -run: "sudo grub-install --boot-directory=/mnt/<sth>/boot /dev/sdX"
I would say, otherwise it works well, but this was a surprise. im just installed ubuntu server (2014.04.01 build) on clean machin, and see this grub-rescue message right after first reboot. What does debconf-show grub-pc say? @Samuel Taylor: Please read the comments above, there are multiple ways on how to fix it. I found out that I actually boot from /dev/sdc in my bios setting. So manually run 'grub-install /dev/sdc' fixed my problem. I figured it was something like that. FYI, in the future, grub updates will probably break because you used grub-install manually. You should use dpkg-reconfigure grub-pc instead, so that the system can remember which drive(s) you have grub installed on and automatically reinstall it when grub is upgraded. After I've updated my system and rebooted today it happened again. Then did a "dpkg-reconfigure grub-pc" as menitoned above, but right after then removed the old kernels with synaptic. Rebooted again, and got the same error: "symbol 'grub_term_highlight_color' not found". I boot from an OCZ 128GB SATA3 2,5" Vertex 4 VTX4-25SAT3-128G SSD with Gigabyte GA-Z87X-UD5H motherboard. Please post the output of debconf-show grub-pc and sudo parted -l.
You have two disk drives with grub only installed on one of them. Most likely, you have an old, broken copy of grub installed in the other and that is what the system booted. Run dpkg-reconfigure grub-pc, and install grub to both drives so that either one should work. Hi, I had it too, but not only after update, after I formatted my ubuntu partition and install it again, it happened again. I can boot ubuntu, but when I choose 'Windows' in grub, that gonna crashed with "symbol 'grub_term_highlight_color' not found"
Thanks for the advice. I have checked and I'd really had a broken grub installed on my second drive. I've removed it and now it works perfectly. I just got bitten by this doing a fresh install of 14.04 with two drives. For whatever reason it decided to write to a different device than it had previously resulting in an unbootable system. Impossible to repair boot, impossible to boot windows. grub rescue fails to boot too. I can only boot my EFI machine using SuperGrubDisk2 cd. And this is on machine without UEFI. As pointed out by Peng (pengwg) at #2, this might be confirmed a bug of grub 2.02. I upgrade my 13.10 to 14.04 (grub was upgraded to grub~beta2~9), then I encountered this problem. My machine is with UEFI. When I see this error, I restarted my computer and selected boot from UEFI file. Then I navigated to the ubuntu uefi file and started my computer successfully. I tried the simple "sudo grub-install --recheck /dev/sdX" way. But it didn't work. The I downgrade all the grub components: grub-common, grub2-common, grub-efi, grub-efi-amd64, grub-efi-amd64-bin to version 2.0. Rerun that "sudo grub-install --recheck /dev/sdX", restarted computer. Everything is back now. For me this owngrading of grub works. Possibly a bug with grub-install in the 2.02 verion. Upgraded from 13.10 to 14.04 on a Lenovo S205 Pad. Also affected. Upgraded from 13.10 to 14.04 on Acer TravelMate 5720 and got into the 'grub rescue' prompt, due to the " error: symbol 'grub_term_highlight_color' not found"
Using BIOS Boot menu was able to boot from the Ubuntu disk - this did bring up the Grub boot menu. Tried the sudo update-grub and that still led to the same problem. Once again, this is not a bug but a misconfigured system. You must make sure that dpkg-reconfigure grub-pc has your boot drive selected so that grub is properly upgraded there. So do I need to run grub-install --recheck /dev/sda1 to reinstall grub there? Where sdX1 must be the drive where your system is installed. When you run the last command you should select the sdX drive, though I guess running it multiple times will install the new version of grub on each drive and give you some piece of mind. You need to use dpkg-reconfigure grub-pc instead of grub-install directly, so that the system knows that it needs to run grub-install on that drive the next time grub is upgraded. pureblood's solution from post 27 worked to correct the Lubuntu grub installation, so I can now boot to Windows and Lubuntu 14.04 from the thumbdrive. However, lacking that thumbdrive, the grub rescue prompt still shows up when I try to boot natively, with an error showing a whole bunch of numbers and letters. pureblood's solution doesn't work, since mounting /dev/sda1 to /tmp/drive and then cding to the directory shows there's no native /dev, /proc, or /sys directory, and skipping to sudo chroot /tmp/drive fails with the message: "failed to run command '/bin/bash'; no such file or directory" (I'm guessing this is because Windows doesn't have bash). Therefore, I don't know how to get to a point where running dpkg-reconfigure grub-pc would work, and since the computer's not mine, I don't want to experiment too much. What's the Windows 7 equivalent to the above solution? If you can boot Ubuntu using the thumb drive, then so so and run sudo dpkg-reconfigure grub-pc. That didn't work. I still get an error: no such device: (a bunch of numbers and letters) when I try to boot regularly into Windows without the thumb drive connected. Wow, this is a serious bug and you set it to invalid and demand from users to run commandline commandos? I just run into this bug, all worked fine on 13.10 all day long, after upgrade my system does not boot anymore. I can fix it, most guys here can fix it, but the 08/15 user runs into this and says "f... this linux" and installs something else. You can NOT demand from a user to run dpkg commandos, or even know about dpkg. Fact is the upgrade to 14.04 breaks the installation, no matter the reason and it needs to be addressed and fixed and not set to invalid. This behavior is really discouraging and the effects are driving ppl away from linux. Crashed a TP SL500 here, working well with 13.10 (kubuntu flavour), dead after error-free upgrade to 14.04. You will have to adapt your configuration to reflect your system's setup but I've posted mine so you should have enough to get it work. You will have to downgrade the files mentioned here by another user. Then an additional step is needed to make Windows 8 (in my case work). Please stop changing the status of this bug and read the existing comments. This error message results from manually installing grub incorrectly. If you manually run grub-install instead of going through dpkg-reconfigure, it will break on upgrade. I didn't run grub-install. I did absolutely nothing to grub before upgrading. I simply upgraded to 14.04, and it broke. Therefore, manually installing grub has nothing to do with it. I agree with the others that this is clearly NOT due to manually running grub-install, since everything was working fine until the upgrade to 14.04 itself ran grub !!!!! As the Head of Quality Management for an IT shop in a large international company, calling this invalid is ridiculous! This is a bug guys, now fix it. This bug, along with other recent activities by Ubuntu (hacked accounts, anyone? ), is really making me have second thoughts about keeping Ubuntu and just going with Windows. By the way running dpkg-reconfigure grub-pc and installing grub to install to both the Windows Drive ( which should have been the primary boot drive when grub ran during the install) and to the Ubuntu drive seems to have worked - for now. We will see what happens during the next upgrade. Same thing occurred when I tried to upgrade ubuntu gnome from 13.10 to 14.04. I've got a dual boot system for year now and it was never considered incorrectly configured in the past, installing and upgrading Ubuntu always worked. I think this bug can't be considered invalid because we have supposedly done something wrong manually. This is not the case if you ask me. Perhaps the problems are related but different. For me, "dpkg-reconfigure grub-efi" does not fix the problem. Downgrading grub as in comment #20 also did not work. Note that this problem also exists in Ubuntu 14.10. Before I get in to all of this, I should explain my setup, so that people who are interested in my solution can figure out if they are in a similar boat. I have a Dell Inspiron laptop with UEFI and a Windows 8 partition. (Earlier I had already turned off SecureBoot in my computer's Setup). I have only one hard drive. Previously I had Linux Mint 15 installed on my computer, and it was dual-booted with Windows 8. I have just installed Ubuntu-Gnome 14.10. After quit a bit of fussing, I have Ubuntu-Gnome 14.10 up and running, and can again successfully dual-boot Windows 8. The problem here is actually a bug that is internal to grub itself, and not to Ubuntu, per se. The problem is that Ubuntu Trusty (14.04) and Ubuntu Utopic (14.10) both include buggy versions of Grub. This is because the Ubuntu people decided to include beta versions of Grub 2.02 in both Trusty and Saucy. (Why this was done, especially for an LTS release is not quite something that I understand). For anyone who has been bitten by this. The news is mostly good: your Ubuntu 14.04/14.10 installation is safe and sound on your computer, and if you have a Windows partition, that is okay as well. The only bad part is: fixing this error is a bit of a pain. What we have to do is to downgrade the version of grub that you are running to the one that is used in Ubuntu Saucy (13.10). Then, we can use boot-repair to get the Windows partition back onto the boot menu, if this is needed. Here is how to do it . . .
Before I get in to the details of how to do all of this, I will tell you how my computer is set up, so that you can change the commands below as necessary. Also, these instructions assume that you have a UEFI system, and that you are interested in the AMD-64 packages. If this is not the case for you, then you can try modifying the instructions below, but they may or may not work. There are basically two different ways that you can get at your fresh Ubuntu 14.04/14.10 installation. On my Dell as the computer is first booting, while the Dell Splash Screen shows up, I can press F12 to get a boot menu. On this menu, I can select the "Ubuntu" option, and I can get into my installation. You might have something similar. If you can do this, then boot into your Ubuntu 14.04/14.10 installation in this way. It will make the process a little bit shorter for you. in how it is installed and upgraded. @psusi how can you tell that? A lot of people may have broken something in their grub that was exposed during the upgrade, but what about the others that found the problem with a plain system and a fresh install? > others that found the problem with a plain system and a fresh install? I haven't seen anyone report this on a fresh install. It is always after an upgrade, which normally replaces both parts of grub on the disk. The symbol "grub_term_highlight_color" was removed from the new version of grub intentionally. When only one part of grub is upgraded, the other, older part generates this error because it is still looking for it and can't find it, because the part that used to contain it was upgraded. There are a few comments on this very page reporting the issue on fresh install. And you did see them; I seem to remember you said you just don't believe them (I'm too lazy to look for it now), but that's a different thing. Anyway, as already discussed, there is clearly some bug, whether it is in Grub or in Ubuntu, if a perfectly working dual boot (whether it was a "fresh install" or it was "tinkered" because that is the _only_ way to get a dual boot with windows 8 to run, as the official installer and all the officially documented methods fail to produce a working dual boot installation) gets bricked by a distupgrade without warning. The maintainer of the Ubuntu package himself agreed to that. By the way, talking about @cjwatson, I'm still wating for an answer to whether or not those of us who were bitten by the bug and and fixed the broken boot can safely install the updates that have since been released, and whether the upgrade to 14.10 will bite us again. > himself agreed to that. No, as already discussed, there is a broken installation of grub. The reason Colin reopened this report is because he wants to put in some checks at some point to detect that it's broken and guide you through fixing it. > been released, and whether the upgrade to 14.10 will bite us again. If you fixed it correctly so the package system knows where it needs to reinstall it in the future, then you won't have the problem again. If you fixed it by manually reinstalling grub outside the package system again, then you will face the problem again. I have only encountered this if [for example] I had grub originally installed in some pbr (eg; sda6) and I later changed the location to the mbr (eg; sda) using grub-install /dev/sda rather than using dpkg-reconfigure grub-pc. Then apparently the release-upgrade reads the prior dpkg info therefore installing grub in the wrong location. That of course explains a broken boot but I never quite understood the error message, it's just not that hard to fix so I really haven't worried much about it. I have had no problem with updates of any of 10.04 packages. My history is that I did a fresh install of 9.04, ran into a problem which I could solve using grub-repair, then upgraded to 9.10 without any problem, and during upgrade to 10.04 ran into this bug, which I solved somehow. > No, as already discussed, there is a broken installation of grub. The reason Colin reopened this report is because he wants to put in some checks at some point to detect that it's broken and guide you through fixing it. You start with "No,", but you confirm what I said. Note I didn't say the bug is in grub itself; I have no idea whether it's in grub or in Ubuntu or in Ubuntu's packaging of grub, but something is broken if this situation happens in the first place. If there is a broken installation, something is broken. A few users got that "broken installation" after a fresh install, so some piece of software responsible for installing it didn't do its job correctly. I (and others) got that "broken installation" after having to manually touch things because the Ubuntu installer just hadn't been capable of installing the system. I didn't tinker with things because I wanted to, I was forced to because the Ubuntu installer doesn't do its job and the docs don't offer any instructions that work, so I had to try things. If I happened to touch something wrong, it was because I was forced to touch things that I shouldn't even have had to touch. > Colin reopened this report is because he wants to put in some checks at some point to detect that it's broken and guide you through fixing it. Which is what must be done to fix this issue. A robust OS (like any robust piece of software) cheks things and warns you if it's going to break. That's not what I did, I installed Ubuntu via LiveCD and then did upgrade via updater. I definitely didn't edit something manually. I only used super grub disk to repair my grub after it was broken by the updater. But go on close this bug. Let's pretend this never happens. Also it's only grub, it's not that hard to repair it for every Ubuntu user affected. This is ridiculous. Can someone else please fix the root cause? It's well beyond obvious by now that Phillip Susi doesn't care at all about ubuntu and its users. It sounds like Peter Totleben has the most complete and useful information so far - can you please submit a new bug report with your findings? > grub outside the package system again, then you will face the problem again. I'm not sure how I fixed it. I followed the instructions provided in some of the comments above by some other victim of the issue. But it was almost certainly the second way. Will I (and others in my situation) hit the problem again "only" when dist-upgrading to 14.10 (which is already out btw) or also when installing the grub updates that have been available for a while? (which I have always avoided installing just in case)? Secondly and most important, what should I do "so that the package system knows" whatever it needs to know, so that I can dist-upgrade without screwing up my working system again? > Will I (and others in my situation) hit the problem again "only"
> while? (which I have always avoided installing just in case)? It can happen on any update, but won't necessarily happen on every update. > dist-upgrade without screwing up my working system again? where it should be installed. You seem to not be listening to people. All of the things that you say are the case are in fact not the case at all. And all of the things that you say are not the case are precisely the case. I installed Ubuntu Gnome 14.10 by deleting all of my old Linux partitions and installing fresh. And I only have one HD. After installing, Grub was broken, with the indicated error. After a little digging, I realized that "grub_term_highlight_color" was a symbol internal to Grub. It was being used in several Grub module files. Then, I noticed that both Ubuntu 14.04 and 14.10 include the 2.02beta version of Grub. 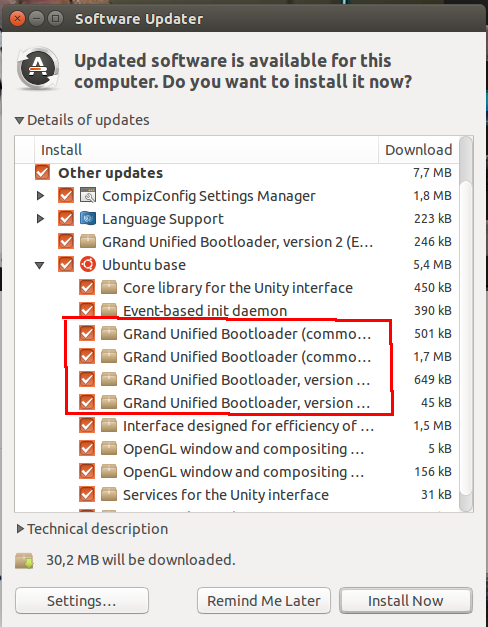 I wondered why the Ubuntu people were packaging releases (and LTS releases even!) with beta versions of the bootloader. So, I downgraded to Grub 2.00 and everything worked perfectly fine for me. The module files for Grub 2.00 do not (AFAIK) include the undefined symbol "grub_term_highlight_color"
So, psusi, the problem is with the version of Grub included in Ubuntu 14.04 and 14.10. You are just making stuff up, and dismissing people's problems solely on the basis of your fabrications. Either provide constructive help or don't post. > are precisely the case. > installing, Grub was broken, with the indicated error. > fabrications. Either provide constructive help or don't post. drive your system actually boots from ). > and fail to boot. Which confirms there's a bug somewhere. Which is something that should never happen no matter what. The very fact that this can happen is _the_ bug (unless, of course, one manually runs a command to purposefully create that situation, with some kind of --force option or after answering "yes" to a warning prompt). Assuming that your diagnosis is correct, that is. Of which I am not completely sure, given that you have a history of negating facts (as in "I haven't seen anyone report this on a fresh install"). > Which confirms there's a bug somewhere. bios. If grub outright failed to install, then there *may* be a bug. "Never happen no matter what" is asking for a magic wand and unicorns. There are some things we can control, and some we can not. > manually chose it is not a bug. Who talked about manually choosing? > "Never happen no matter what" is asking for a magic wand and unicorns. "No matter what" was a sloppy phrasing, agreed. I should have said "whenever it can be avoided". No need for magic wand or unicorns, just a few checks. And here it definitlely can be avoided at least to some extend, while absolutely nothing is done to even attempt to avoid that. > There are some things we can control, and some we can not. And here, there are definitely things that can, and hence should, be controlled, and that are not being controlled, hence a bug. Note that I'm always talking about Ubuntu as a whole; which part of it is responsible for doing right what is being done wrong, I don't know. It may be Grub, it may be the Grub packaging in Ubuntu, or it may be some other part of ubuntu. Ubuntu is miserably failing to provide an easy or at least reliable way to install it in dual-boot on a system that has another OS, namely Windows 8. Following the instructions that are given during installations fails. Following the instructions that are given in the official docs fails. You're left alone either tinkering or using third party repair tools. And when you do and get it to work, a system upgrade on a machine that works breaks it. That's simply not an acceptable UX. That's my experience. Other users have reported doing a bare fresh zero-tinkering install immediately resulting in a broken system, or doing a bare fresh zero-tinkering install which resulted in a working system which broke at some later dist-upgrade. That's something that should never happen, and here I really can say "no matter what". Comments 55, 91, 137 report cases where absolutely no manual installation or third party tools were ever used. Did you have a look at this other bug https://bugs.launchpad.net/ubuntu/+source/grub2/+bug/1311247 ? There has to be something wrong in Ubuntu 14.04 concerning grub,because in some fresh installations,after everything has finished normally and the OS has been apparently installed without errors,then the system simply won't boot at all,period. The workaround has been installing grub to a dedicated boot partition,something I wouldn't call a normal installation procedure:I've never had to do that with any other Linux system so far,including previous Ubuntu releases. Here is some information that might shed some light on the problem. 1. I tried to upgrade to 14.04. The upgrade seemed to succeed, but would not boot with the dreaded grub_term_highlight_color missing message. 2. I took a tar copy of the VM with the failed upgrade. I still have this copy. 4. I used the recommended "sudo dpkg-reconfigure grub-pc" command. The message informed me that the disk that grub was originally installed to was no longer present. I believe this message is true. It also presented me with a list of disks to install grub to. There was no default chosen for me (I expected to find /dev/sda as default). If I hit OK without choosing a disk, it warned me that grub would not be installed. I went back to the list, chose /dev/sda and hit OK. It then did its job with "No error reported." 5. I then did the upgrade to 14.04. The upgraded system booted normally. SUCCESS! My conclusion is that the upgrade process on my original system NEVER INSTALLED GRUB at all! When it did the equivalent of the dpkg-reconfigure grub-pc, it found that the original disk grub was installed to was missing (true) but then decided NOT to install grub anywhere. In comment 268, Philip Susi indicated this might be a bug, and I agree it is a bug in my situation. I suggest that, at the end of the upgrade process, when the upgrader asks whether or not to remove obsolete packages, it should also warn the user that grub was never installed and give the user another chance to install it. anything at all like that. I guess I did not make myself clear in #272. When the upgrade to 14.04 from 13.10 failed the first time, the message I got on attempted boot was, "error: symbol 'grub_term_highlight_color' not found". That points to this bug. Bug 1311247 does not give that error. Sorry,the bug I've linked is about grub either breaking after an update to 14.04 (for some people) or not working right after a clean install of 14.04 (for some other folks,including me):I somehow assumed that it could be related to this one,although the error message is different. I just install Ubuntu 14.04.1 on a partition that previously had Ubuntu 13.10 on it. Now I can't access Windows or Ubuntu. All I get is the grub_term_highlight_color missing message. What should I do now? /var/log/installer from your hard drive. So, is this what I need to do in order to prevent my computer from being bricked again by an upgrade? Will this ensure that updating grub and upgrading to 14.10 won't screw things up again? And then I guess that will ask me for some parameters, or to choose something. If so, what command should I run to figure out what my current perfectly working configuration of grub is and make sure it is preserved, and/or to figure out the correct answer to whatever dpkg-reconfigure prompts may show up? dpkg-reconfigure asks you which drive or drives you want grub to be installed to ( and reinstalled to during future upgrades ). If you only have one drive then the choice is simple. If you have more than one, then generally sda is the one your system boots from, but if you have reconfigured your bios to boot from another drive, then that is the drive you should use. If in doubt, it doesn't hurt anything to just install it to all of your drives. Choose sda to match your list above (or others or all drives if you want grub everywhere). This way it's safe(r) in case of future updates. This will invoke the command "grub-install /dev/sda" automatically then and every time needed. The problem seems to be that this was not stored in config "back in the day". I've encountered the same problem. Is this an issue that won't be fixed? I thought I had a pretty normal setup. Dual boot windows 7 and Ubuntu. Installed Windows first, then Ubuntu, used all default/recommended settings. Now left with a totally trashed bootloader for both OSes, and wasted best part of a day trying to fix it. Now resorting to reinstalling both OS. In future, a bright red warning, something along the lines of "Updating Grub may render your computer unbootable" would be handy, so its clear that unticking the Grub package upgrade might be a good idea. Since I'm now reinstalling my entire system, what is a "normal" setup? Ie what setup will survive future Grub updates? Baring in mind I'm dual booting with windows, both on same HD. My workarounf was to enter the startup mode by pressing F12 (Dell Inspirion) and boot from there. If not, I would see the "error: symbol 'grub_term_highlight_color" message from grub-rescue. After a next update, instead of grub-rescue, I could only hear annoying beep sounds, occurring every 2 seconds (lasting for infinite time). I still was able to use the EFI-BIOS boot options to restart. However, after my latest update, even the F12 Option to enter EFI Bios has been lost. All I got where the Beep's. After several tries (pressing the on / of button several times, until F12 is displayed) , I may reach the boot menu. I tried to redo the boot order with efibootmgr --- no success. After the next startup, the boot order has been overwritten. I tried Boot-repair --- no success. Sorry, I forgot to mention: I am on an UEFI System. @cjwatson a year has passed since you said you had some idea about how to fix this. Any progress on that? I want to try and run dpkg-reconfigure as suggested many times, so that I can finally install grub updates and also upgrade the distribution, without fear to brick my computer again due to this bug. Because it's clear that if I'm going to wait for the bug to be fixed it's going to be forever. Now, first of all, @psusi et al talked about running "dpkg reconfigure grub-pc", but I don't seem to have grub-pc installed at all. So what is the exact package name against which I should run dpkg-reconfigure? I have figured out that /dev/sda9 is mounted as "root filesystem". Am I right in assuming that /boot is a real, physical folder of that partiton? So, I guess that's the "bad" version of grub. I seem to have only one physical harddisk /dev/sda. So, is this correct: the "bad" copy of grub is installed on /dev/sda9, hence (??) the "good" one is almost certainly in the MBR? Does that mean that when prompted by dpkg-reconfigure, I should choose /dev/sda? (does that mean the MBR of that disk)? @Teo1978, you are using an EFI booting machine, so don't have grub-pc and the dpkg-reconfigure does not apply to you. IIRC, the problem on EFI is that if you have used grub-repair or whatever it was called, it makes a copy grubx64.efi and configures the firmware to boot that instead of the original, then when grub is upgraded, the copy is now stale. You can see which file your system is set to boot with sudo efibootmgr -v, and iirc, the copy was named /boot/efi/EFI/BOOT/Bootx64.efi, and the original is /boot/efi/EFI/Ubuntu/grubx64.efi. Displaying first 40 and last 40 comments. View all 289 comments or add a comment.